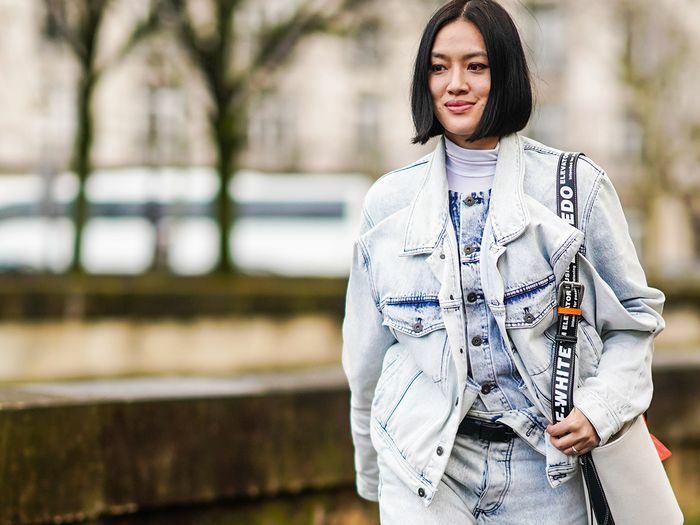 It’s no secret that denim jackets have returned in a big way, but what’s interesting is the range of styles and colors we’re seeing on the market. No longer is it just the standard style you remember from growing up. Now there’s everything from oversize versions to jackets in sorbet shades like buttercup yellow and tangerine to super-cropped silhouettes that are perfect for pairing with high-waisted jeans. If you’re ready to work some of these cool styles—or even the trusty classic cut—into your wardrobe, you might want to take a look at how fashion girls are wearing theirs. Caroline de Maigret wears her denim jacket with coordinating jeans but them layers a second metallic jacket on top for a cool, unexpected look. On the other hand, street style star Pernille Teisbaek opted for a denim skirt and sleek white ankle boots to pull off the look. Here, we’ve rounded up five cute spring outfits with jeans jacket that are worth repeating. Add a second jacket on top of your outfit for an unexpected look. Pastels are the shades of the moment. Layer your denim jacket over a simple tee and high-waisted pants. Button your oversize jacket in the middle for a waist-cinching effect. Double denim is always cool. Available in sizes UK2 to UK18.